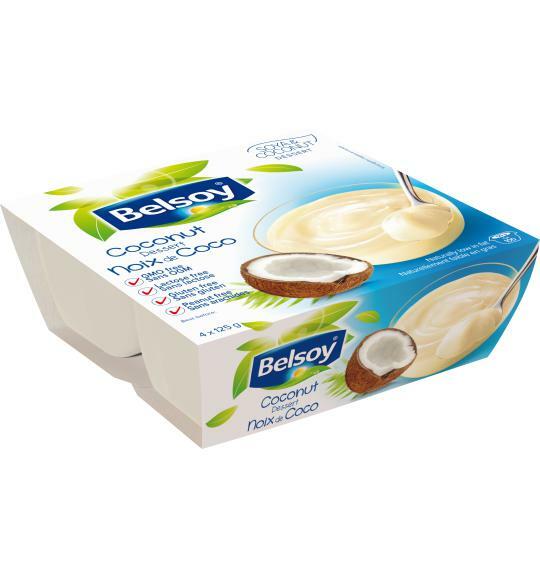 Take a lingering Belsoy Dessert made from coconuts and soy all to yourself – you deserve it! Any time, any place, this tropical indulgence is the perfect treat. Enriched soya drink (water, hulled soya beans (4,6%), tri-calcium phosphate, vitamins (riboflavin, B12, D2)), sugar, coconut milk (5,3%) (coconut cream, water), modified maize starch, calcium carbonate, thickeners (pectin, carrageenan), flavourings, sea salt, acidity regulator (monopotassium phosphate). Contains soya. Free from dairy, gluten and peanut.